On October 12th, Lindsay Little Theatre opens its 2018-2019 season with a production of David Auburn’s award-winning drama Proof. 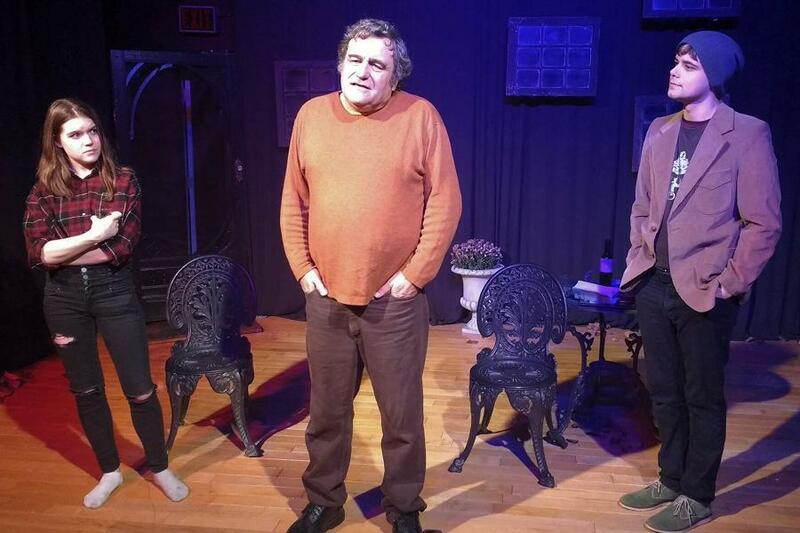 Directed by Altaire Gurai and featuring a powerhouse cast consisting of Anwen O’Driscoll, Anthony Jackson, David Draper, and Ellen Giddings, Proof is also Lindsay Little Theatre’s entry into the Eastern Ontario Drama League festival. First performed by the Manhattan Theater Club, Proof made its Broadway debut in 2000 where it was an instant hit, winning three Tony Awards and featuring high profile performers such as Mary-Louise Parker, Neil Patrick Harris, Jennifer Jason Leigh and Anne Hesche among its cast. Considered a modern classic by critics, Proof won the Pulitzer Prize for Drama in 2001 and was turned into a 2005 film starring Anthony Hopkins, Gwyneth Paltrow, and Jake Gyllenhaal. When: Friday, October 12 & Saturday, October 13, 2018 at 8 p.m.; Friday, October 19 & Saturday, October 20, 2018 at 8 p.m. Written by David Auburn. Directed by Altaire Gural. Starring Anwen O’Driscoll, Ellen Giddings, Anthony Jackson, and David Draper. Tickets available in person or by phone at the Academy Theatre box office (2 Lindsay St. S., Lindsay, 705-324-911), online at academytheatre.ca, or at the door the night of each performance. Proof is an unlikely drama that crosses mathematics with grief, genius, and madness. It tells the story of Catherine Llewellyn (Anwen O’Driscoll), who is mourning the death of her father Robert (Anthony Jackson), a celebrated mathematics professor at the University of Chicago. Having taken care of her father for years after he succumbed to an unnamed mental disorder, Catherine is left at a crossroads in her life upon his death, feeling she has watched herself crumble under the isolation of tending to her father’s well-being. Considered a legend among the sub-culture of mathematicians, Robert’s death prompts one overzealous professor, Harold Dobbs (David Draper), to start scouring the dead mathematician’s notes for the “proof” of an unpublished theorem. As Catherine deals with her own depression, her older sister Claire (Ellen Giddings) arrives from New York to try to take care of matters and make the hard decisions Catherine seems to be unable or unwilling to make. While Catherine’s resentment towards Claire grows, Harold uncovers a notebook that will turn the world of mathematics on its head. Just what does it mean for Catherine and Claire, what does it prove, and who was responsible for it? When director Altaire Guari told me last summer that she was putting on Proof, I initially questioned her about her choice in show. Up to this point, my experience with the play had been underwhelming. Altaire told me that my perception of Proof as a “dull math play” was wrong and that she would change my mind. As someone whose knowledge in everything theatre I completely respect, Altaire’s challenge intrigued me. If she says that Proof has more to it than I previously believed, then I was will to give it another chance. 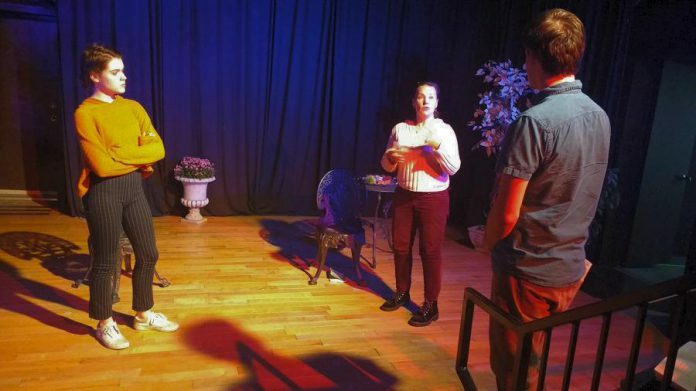 An intense director with a no-compromise ability to push her performers to the dramatic heights that she wants, Altaire has assembled an exciting cast of individuals to bring Proof to the Lindsay Little Theatre stage. If I didn’t believe in the show before, Altaire and her company have shown me that the secret to creating a great show is the combination of an experienced director and a fantastic cast. It’s a great treat to see Anwen O’Driscoll again on the local stage. One of the most impressive young actresses that has crossed my radar in the past year, Anwen just finished wrapping up filming on the second season of CBC Television’s hit series Burden of Truth where she plays Taylor Matheson. Anwen puts an interesting spin on Catherine by giving her a sense of poise despite dealing with her own remorse and devastating grief. 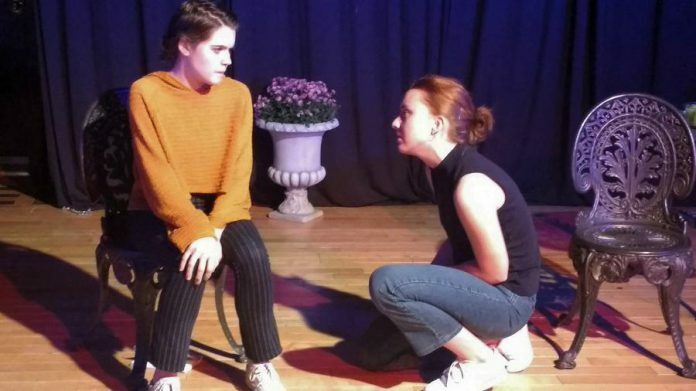 An exciting actress to watch, Anwen is a stand-out on stage, and this is a chance to see a rising young actress before local stages become too small for her. What makes Anwen such a good actress is the way she takes a role and gives a fully believable performance by becoming that character. As Catherine, Anwen becomes a vessel of emotions overflowing to the point that she cannot contain herself. When she explodes, she screams with true fury; when she hurts, she cries genuine tears. Her emotional performances are raw and real, making her a dynamic actress to watch. I can in full confidence say that Anwen O’Driscoll is a very big deal. David Auburn’s “Proof” debuted on Broadway in 2000. It won three Tony Awards, won the Pulitzer Prize for Drama, and was made into a 2005 film starring Anthony Hopkins, Gwyneth Paltrow, and Jake Gyllenhaal. The Lindsay Little Theatre production runs October 12, 13, 19 and 20 and is also the theatre company’s entry into the Eastern Ontario Drama League festival. In the role of Harold Dobbs, Altaire has cast another exciting young actor, David Draper. Winning the Best Actor Award last year for the Easter Ontario Drama League Festival, David is another performer who has big potential in moving far beyond the local stage. With a likeable personality and marquee idol good looks, David has the perfect amount of charm and modesty to make Harold a likeable foil to Anwen’s Catherine. But David keeps Harold interesting by allowing other aspects of the character come through in the piece, including an awkward goofiness as well as a good deal of intellectual elitism. As the senior member of the cast, Anthony Jackson gives a commanding performance as Robert by creating a character who is warm, brilliant, endearing, and imposing. 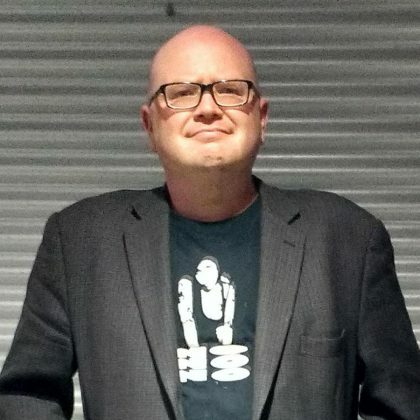 Seen in a series of flashbacks, with the exception of one key scene where he is possibly a “pink elephant”, Anthony is put in the position of creating a character who already has a mythology early on in the show. Although it is quickly established in the play how difficult life became with him, Robert must have qualities that allowed Catherine to stay loyal to him, and to have his students worship him. In every version of his mental state, Anthony is able to give a performance that showcases his greatness, but has moments of sensitivity that allow the audience to understand why the people who cared about him loved him so much. But while the seasoned cast of Proof each gives remarkable performances, it is Ellen Giddings as Claire who made the biggest impression on me. I was astonished to learn that Proof is Claire’s first acting experience. Filled with a strong sense of assurance and a misdirected emotional maturity, Claire is a well-meaning character, but not necessarily a nice person. With perfectly timed delivery and tons of real emotion, Ellen can deliver lines with a sugar sweetness, or with so much toxin that the audience can choke on her words. Ellen and Anwen’s chemistry together on stage is explosive, and they play off each other in scenes so real you forget you’re watching a stage show and at times feel that you are observing a real-life awkward reunion between two sisters who can barely stay in a room together. Ellen is an extremely talented young actress and one that I hope to see again and again on stage. I am completely spellbound to know that she has never acted before, prompting me to ask just where she has been hiding. You are not going to want to miss this wonderful actresses’ acting debut. Ellen Gidding’s performance is going to blow your mind. Although I have seen Proof before, while watching the Little Lindsay Theatre’s production of the show I began to understand just what makes the show so special. With the combination of the dynamic cast and passionate direction, I realized that Proof isn’t really about mathematics at all. Filled with humanity, it’s a show about finding dignity in mental illness, and how family dynamics are more complicated than the most complex math theorem. In the hands of the right people, Proof is a beautiful show. Over the next two weekends, you should be putting the Lindsay Little Theatre on your map. Proof is a show worth seeing, if not for the story then for the incredible performers featured in this show. These are actors that you need to see. 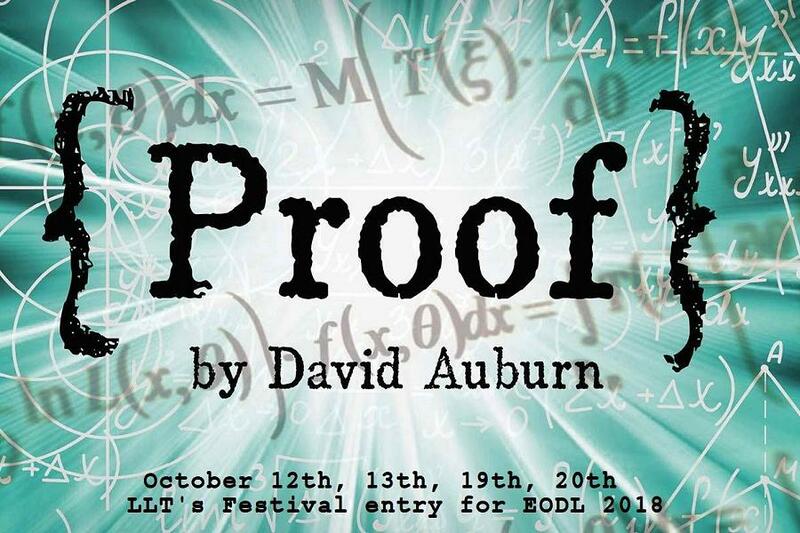 Proof will be performed at 8 p.m. on October 12th, 13th, 19th and 20th at the Lindsay Little Theatre. Tickets are $20 and can be purchased in advance in person or by phone at the Academy Theatre box office (2 Lindsay St. S., Lindsay, 705-324-911), online at academytheatre.ca, or at the door the night of each performance.